I’m still trying to digest today’s announcement that Nokia will adopt “Windows Phone as its primary smartphone strategy”. Symbian will become a “franchise platform”, which based on the slide below (from one of Nokia’s announcement press PDFs) means will it will be gradually phased out. Meego will become a research project for exploration of future products. 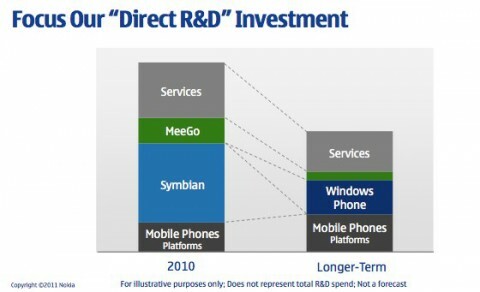 As the side below shows R&D investment in MeeGo will drop by about two thirds. That slide also suggests that massive layoffs in Nokia R&D lie ahead. I’ve had about 30 minutes of hands on with Windows Phone. My first impressions as a user are generally good. WP has a fresh new UI that seems responsive and intuitive. It’s a young platform and a bit unfinished in some areas. For the sake of the company’s employees, investors and partners I hope that Microsoft and Windows Phone prove to be a good fit for Nokia and help to reverse its slow decline. But I’m also sad for all the dedicated Symbian and MeeGo developers, designers and QA folks inside and outside of Nokia who will have their lives and livelihoods disrupted. I’ve been through a couple of these sorts of transitions myself and it’s hard, very hard both for those let go and those who remain. As a proponent of open source and open systems in mobile the news is disheartening. Symbian and MeeGo are open source. Windows Phone is closed. The geek dream of a truly open mobile platform is dashed yet again. I feel that Symbian could have been saved. It’s a great multi-tasking OS with excellent imaging and video support that is also very power-efficient and runs well on low cost hardware. The knock on Symbian has been that its user interface is dated and user experience clumsy and unintuitive. I feel that with Symbian^3 Nokia made a great first step in modernizing and simplifying the Symbian user experience. I still think that with a bit of performance optimization and a committed effort to quash some annoying bugs, Symbian would make a great OS to compete with Android in the low-end smartphone market. I’m even more disheartened with Meego’s demotion to a lightly funded lab project. Over a year ago I had a Nokia N900 running Maemo, MeeGo’s predecessor. The hardware was clunky but the OS was very good. It was fast, stable and had a gorgeous, intuitive and powerful user interface. In 2009 Maemo was more finished than Windows Phone today. It had multitasking, desktop Flash, copy/paste and the best browser I’ve ever used on a mobile phone – all things that Windows Phone currently lacks. Best of all Maemo ran the full desktop Linux plus X11 stack and could install apps from any source including many desktop Linux apps. There’s something very exciting about a handheld device ably running a full open source desktop coupled with a touch friendly UI. I had high hopes for Maemo and expected Nokia to quicky tie up a few loose ends like the lack of portrait mode support in most apps and begin releasing a long line of polished, consumer oriented Maemo smartphones. Instead Nokia entered into an alliance to combine Maemo with Intel’s Moblin netbook OS to produce MeeGo. Unfortunately the alliance seems to have resulted in nothing but delays and setbacks. Rumors suggest that the N900’s successor has been cancelled and that Nokia is switching to using the not yet commercially available Intel Medfield CPU instead of the ubiquitous ARM processor for its first MeeGo phone. 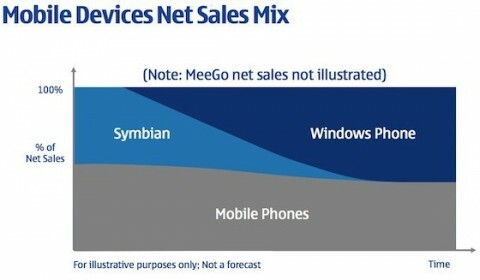 At least Intel seems committed to MeeGo and Nokia is still saying they will ship a MeeGo phone this year. I hope they do and I hope they sell millions of them. If the OS is as powerful and open as Maemo I’ll certainly buy one. Hindsight is easy but I bet if Nokia had stuck with Maemo they would not wound up in the humbling position of having to downsize and rely on using someone else’s OS for their flagship phones. This entry was posted in Nokia and tagged Maemo, MeeGo, Microsoft, Symbian, Windows Phone by Dennis Bournique. Bookmark the permalink. So now we’ll have windows phone, iphone and blackberry operating system powered devices that are closed, lack customisation and are expensive (both device and third party wise). It’s only from android powered powered devices that you’ll be able to get a great cost effective powerful device with tons of free and cheap quality third party applications. Tho let’s hope the demise of symbian doesn’t slow down android development. As for windows phone powered nokia devices, unless nokia develops a bbm like application and bis like data plan, the nokiasoft deal is gonna be a disaster considering that windows phone doesn’t have a lot of applications developed for it and nokia screwed symbian developers with qt which left a really sour taste. Buying a smartphone just for great hardware, user interface and and great gps cabalities aint very smart. Maybe nokia shouldn’t have announced this deal so soon. Maybe nokia shouldn’t make windows there primary smatphone platform. I fear your wrong, Timo, for wasn’t the promise of Nokia its possible openness? Its Europeaness? And now, a much smaller universe. You should read (and suffer) the pains expressed on the Nokia development forum – quite painful, I can tell you! I, for one, think that this alliance will benefit both parties and most of all it will be good for the mobile web. All that aside, to blame Stephen Elope for this pass and all the woes of Nokia is ridiculous. There has been, since, perhaps, 2005, something rotten in the heart of Finland, when Nokia became a massively bureaucratic and sclerotic organisation, with cross purpose development and an absurd lack of leadership. This is just the inevitable coup de grace. This strategy, Dennis, is so odd and so strange, I don’t know what to say. All nokia had to do to satisfy at least 90% of the gripes was put 100 developers on to the web browser for 100 days! How hard is it to get a good version of webkit going? As their competitors have shown? I mean symbian, at its base, is a damn good system. As it is, is WP any good (I’ve not used it)? What will distinguish nokia from HTC? ‘Beautiful engineering’, I suppose? This is such a dastardly, cowardly move and such a betrayal, I’m stunned! Thank you for being reasonable. Like you and many others, I have had a geek dream of an open linux-based mobile system since I first got my hands on the Nokia N800 over three years ago. I do love & use my N900 and continue to be stunned that the OS and UI have not carried over into other Nokia projects. Also, I am one of those developers who believed Nokia in October, sat down and learned Qt. I got excited and then planned my winter & spring around making two apps in it that would work both on the N900 and Symbian^3. Thus this morning was a huge kick in the gut. Agreed, the way Nokia lead developers down the Qt garden path to a dead end was very unfortunate. I’m pretty sure that the developer advocates within Nokia acted in good faith in pushing Qt.This change in strategy was formulated at the highest level (Elop, a handful of very senior managers and the board). I’ve been through a couple of major restructurings in large corporations and the rank and file are the last to know. However Elop, as a former manager of development teams, had to have known that killing Qt after Nokia had so actively promoted it would send a very negative message to the many developers who invested months in getting up to speed with Qt. I’m interested to see what becomes of Trolltech and Qt. It’s of no use to Nokia going forward so I’m hoping they will sell it to a company that believes in Qt, perhaps Intel or HP?